Title: Mount Dora & Lake Eustis Rwy. Description: Mount Dora 7 Lake Eustis Railway #101 "Herbie" is seen East of Mount Dora. At one time the bridge had "A C L R R" on the side, but today it Sports Florida Central Railroad. 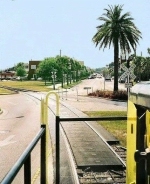 The line that MDLE operates on is a branch off the Florida Central that is no longer used. Description: Herbie is waiting to depart Mount Dora on a Saturday Afternoon. Title: Mount Dora & Lake Eustis "Herbie"
Description: MDLE 101 "Herbie" leads the excursion train in the absence of GP10 8330, which is pulling a Winter Garden excursion special. Description: Ex-Mount Dora & Lake Eustis Railway 101 "Herbie" leads Inland Lakes Railway "Lake County Champion" from Mount Dora to Eustis. At Tavares, the train will pass by the south leg of the wye & shove to Eustis. Description: Inland Lakes Railway "Lake County Champion" is pulling into the wye at Tavares enroute Mount Dora with the dinner train consist tacked on the end. At this point, GP 8330 on the rear is pushing the train. Unclear as to why they combo'ed the trains as there is no advertised Sunday evening service. Description: A long way away from the Central Florida excursion glamour.